Since I am a bit behind on my blogging, this week you get a 2 for 1!!!! Mr. Radiation (Ted Sprager) is sitting behind a computer when he gets an online message. He realizes he isn't connected to the internet so he doesn't know how this is possible. The message is from Hana Gitelman (who is Israeli) and her secret power is that she can access the internet with her mind (or send messages with her mind - not sure about that one). She shows Ted that she has the heroes marking and said it was done by Primatech Paper Co. She suggests that her and Ted go after Mr. Bennett so Ted can blow him up. Claire finds her mother collapsed on the kitchen floor at home. She is very worried about her mother. Her mother goes to the hospital and the Doctor questions Claire about what could have happened to her mother's head. Claire tells the Doctor everything about her father and the Haitain and erasing her memory. The Doctor doesn't believe it. When Mr. Bennett shows up at the hospital Claire is so frustrated that she tells her dad off saying she knows whats really happening. Her dad tells Claire about Sylar coming to get her and that is why her mom is in this condition. Claire isn't ready to let it go. Before Mr. Bennett goes to the hospital he is in NY talking to Isaac. Isaac tells him that he is painting the invisible man. Mr. Bennett gives Isaac a gun and tells Isaac to shoot Peter when he sees him so he can save the world. Simone shows up and asks for Isaac's help to find Peter. Isaac tells her to stay away from Peter. On the rooftop of the Deveaux Building, Peter and Claude are still training. Mr. Bennett and the Haitian show up and attack Peter and Claude. 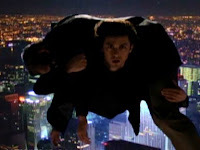 Peter is able to save both of them and flies away with Claude on his back (such a Superman moment!! ---- SOMEONE FLIES) Then Mr. Bennett gets the phone call from Claire that Mrs. Bennett is in the hospital. Claude isn't happy with Peter and runs off. Peter realizes Isaac tipped off Mr. Bennett. He goes to Isaac to confront him. Meanwhile, Hiro is still on his search for Ando. He convinces the Gaming Commission Officer to take him to find Ando and Hope. The Gaming Commission Officer doesn't think having a partner is a good thing and tells Hiro it can only end badly. They find Ando and Hope and a shooting match starts. Ando gets hit and him and Hiro hide in the storage compartment of a bus. Hope finds them and tries to shoot them but Hiro uses his powers to reverse time and stop the bullet. The Officer and Hope are arrested and Hiro tells Ando to go back to Japan. Hiro gets on a bus, alone, to Las Vegas. Matt's wife, Janice Parkman, finds the diamonds that Matt kept from the time he was protecting the diamond buyer. Janice is upset and tells Matt to give it to the Police. Before Matt can make a decision he gets a phone call from Ted. He leaves to meet up with Ted and Hana where they talk about the mark and the radio isotope used in subject tracking (if they can track why can't Mr. Bennett ever find who he is looking for?) Matt reluctantly agrees to help get Mr. Bennett. Syler and Mohinder are on a quest to meet Dale, who can hear any sound. She listens to loud rap music because the world is just too loud. Syler gets hungry for blood and powers and he kills Dale. 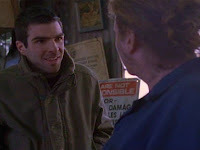 The next day Mohinder and Sylar go to visit Dale and find her dead. Syler convinces them to run off because otherwise people would suspect they killed Dale. Mohinder known Syler did it but he still doesn't know Syler is the guy sitting right next to him. Back in NY, Peter goes to confront Isaac. Peter says Isaac is just jealous because of Simone. Peter uses his powers to throw things at Isaac. Isaac pulls his gun on Peter and Peter goes invisible. Isaac starts shooting and suddenly we hear a woman's scream. Isaac shot Simone who just walked through the door (SOMEONE DIES). Isaac and Peter sit over Simone's body and watch her die. The episode ends with the Bennett family coming home from the hospital with some angry heroes waiting for them inside. This episode departed completely from the normal flow of Heroes episodes. Instead of jumping around from one hero to another, this week focused solely on the Bennett family (the Mr. and Claire mostly) and used a bunch of flashbacks (in black and white, just in case we didn't get it). It followed more of a "Lost" format - on a good day for Lost. This episode attempted to answer a bunch of open questions about Mr. Bennett and what he does. Last week we ended with Ted and Matt in Mr. Bennett's home. We see Ted melt down a door handle to get in the house. They search around the home to find some evidence. They then notice that the family just got home and is walking up to the door. They argue about what to do but before they can decide the family is right in front of them and Ted is shouting at Mr. Bennett. Mr. Bennett claims to know nothing. Then we get our first flashback. Mr. Bennett is interviewing for a job with Primatech Paper. Thompson (his boss) is telling him how he will be teamed up with another guy with powers (we find out it is Claude) to help do his job and to keep him honest and make his job look legit (what is his job exactly???) Apparently they are keeping these people who are "fragile like teacups" safe. Back in the present, Matt is reading everyone's minds and finds out that Claire knows everything and he says that out loud. Her dad now knows that her memory wasn't erased. Claire and Matt go into another room and he keeps on reading her thoughts. She mentions Peter Petrelli and they start talking that they both know him. And then Claire tells Matt everything about her own powers. We go back to the black and white world on the top of the DeveauxBuilding. Hiro's father is there and he is speaking Japanese to Mr. Bennett. He tells Mr. Bennett that he will take her in and raise her but "She belongs to us. If she manifests, we take her." We know Mr. Bennett knows of her powers and that she has "manifested" but he has been keeping her from them. I wonder if that is how Hiro's dad got Hiro? At the home, Ted is going nuts. Mr. Bennett pulls a gun on them which doesn't stay in his hands very long. Ted gets the gun and threatens to shoot Claire's mom. Mr. Bennett uses his thoughts to communicate with Matt. He tells Matt to shoot Claire instead (because she will survive) and Claire is thinking the same thing. Matt shoots Claire and gets into a fake fight with her dad to make it all look real. They then take Claire upstairs so Ted can't see her heal. She coughs up the bullet and is told to stay there. Then Matt and Mr. Bennett go to Primatech to get Ted what he is demanding - a cure and some answers. Ted stays behind to continue to scare the family. The next flashback shows Mr. Bennett learning about the Haitian for the first time. He tells his boss that his wife is suspicious and so they send off the Haitian to erase her memory. In present time, Matt and Mr. Bennett are at Primatech and the Haitian shows up. Mr. Bennett questions him about erasing Claire's memory and the Haitian says he answers to someone else (who??). Matt insists that time is running out and that they need to get back to the house. Seven years earlier, Mr. Bennett is instructed to kill Claude for a security breach and hiding a person with superpowers. Claude calls out Mr. Bennett because he is doing the same thing with Claire. Mr. Bennett shoots Claude anyway, who turns invisible and Mr. Bennett assumes he died (but we all know the truth). In the present time, Claire is sneaking around the house and Ted hears something. He goes to check it out and sees Claire isn't in her bed. She made her way downstairs to help free her mom and brother. Ted catches her and ties her up with her mom while her brother escaped. Claire's mom thinks Claire is a miracle from God because she didn't die. Claire then tells her mom all about her dad's lies. Ted hears about Claire's ability to heal and realizes that Matt knew about it and that is why he shot her. He starts burning up and Mr. Bennett and Matt come in the door. The Haitian frees Claire and her mom and they leave the house. Matt tries to calm down Ted. Outside, Lyle calls the police. Inside, Mr. Bennett says he did not make Ted the way he was but found him when he was giving off lower levels of radiation. Thompson shows up and goes to shoot Ted and Mr. Bennett says not to because it will set him off. He doesn't listen and Ted blows up the house. Everyone rushes out and Mr. Bennett and Matt stay behind to use a tranquilizer on Ted but can't get close enough. Claire comes back in the house and tells her dad to leave and let her do it. She is such a hero! She gives Ted a shot and leaves the house completely burned up. Mr. Bennett knows he must now turn in Claire. After this ordeal, they go to Primatech. Thompson says the Haitian must die for hiding Claire, but nobody can find him. Ted is put in a cell and Matt is having his brain scanned. It looks like Matt is being set up to be Mr. Bennett's next partner. Meanwhile a new woman is shown who also has some powers we don't know about but she is supposed to clean up Mr. Bennett's mess. Thompson asks Mr. Bennett when he should expect Claire and he said he will bring her in right away. Mr. Bennett and Claire drive down the same road he and Claude drove down years earlier. She asks where she is going and he says he doesn't know. Then there is another flashback of Claire and her dad three years earlier. Claire is helping her dad pick out glasses (the entire episode during flashbacks we get a rim-less Mr. Bennett) and she asks if she too will need glasses one day. This is the moment she is informed that she is adopted. At first she is upset but her dad tells her they are a real family and how much they love her. She chooses his glasses and when asked "how do I look?" she says he looks like her dad. Back on the same bridge where Claude was shot, the Haitian, Claire and Mr. Bennett stand together. Claire and her dad say a tearful goodbye. He instructs the Haitian to shoot him in the stomach and make it look like the Haitian shot him and took Claire. Then he tells him to erase his memory so they could never find Claire. He is shot and says "I Love You, Claire Bear"and then has his memory wiped out. Pictures from Heroes-Pictures and Buzz Sugar and The (TV) Show Must Go On.